Looking for an easy healthy recipe to warm you up during those cold winter days? 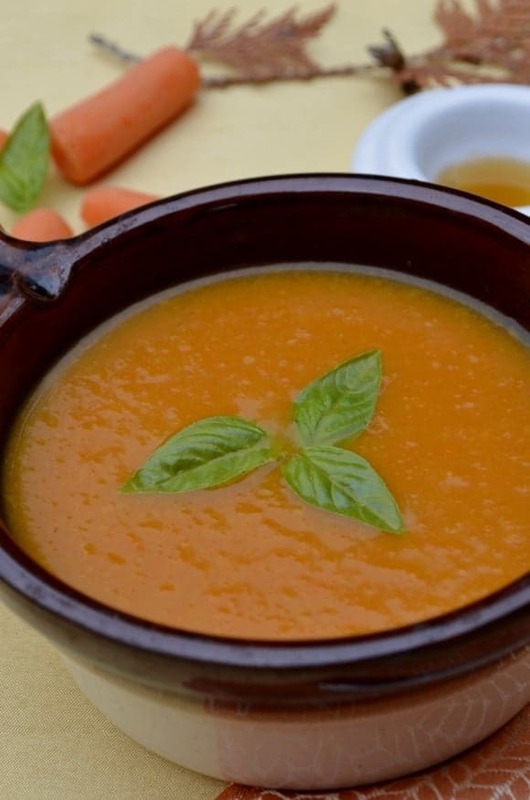 Try this carrot maple soup. I am sure you will fight over it. It’s just that delicious! I have never considered mixing carrot and maple syrup until I read a french cookbook suggesting that mix. The Carrot Maple soup looked delicious and I thought it will be a great twist on my usual caramelized carrot soup. Besides, it is ready within 40 minutes (preparation included). 2 cups of baby carrots. The recipe called for 8 carrots diced. 1 tsp of curry powder. You can replace it with this Blue Dragon Curry Paste. I tried it both ways and I prefer it with the curry paste as it adds more flavor. optional: 1 tsp of ginger. I used fresh ginger shredded ginger. In a large bowl, add olive oil, onions and ginger. Cook until onions are softened. Add the carrots, maple syrup and broth. Cover and let it simmer for 30 minutes. Then blend it well. I usually blend half of the soup first and then the second half after. My blender cannot sustain a large quantity of soup and I don’t want to have splashes all over the kitchen. This carrot maple soup is perfect with a delicious cheddar meat loaf, some garlic bread . It is great on those cold winter nights. I find it is also a great way to use those large bags of baby carrots that I buy from Costco. Those carrots are not very tasty after 5 days so adding them to this easy healthy recipe is a great way to repurpose them. 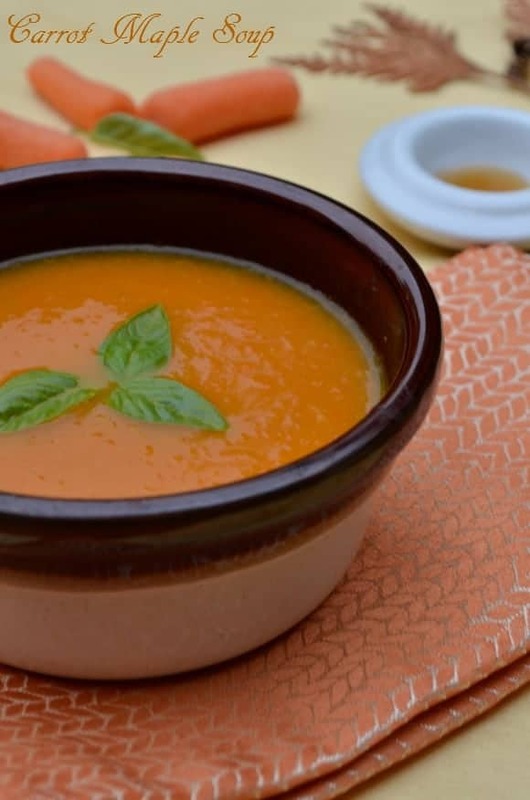 If you’re looking for even more carrot goodness, check out our favorite holiday carrot soup recipe! See our Pinterest soup board for more soups for the fall and winter! Have you ever made carrot maple soup before? Tell me about it. I have a whole whack of carrots in the fridge and wasn’t sure what to do with them. I’m thinking carrot cake cookies and this delicious sounding soup!! The best part is that I have everything on hand. Thanks for the recipe!! Now all I need to find is a nice seasonal bread recipe to go with it. I have never had a carrot soup before and the addition of maple syrup to this one really makes me want to try it!! Cannot wait to try this on one of these cool Fall evenings! Thank you so much for linking up at Tasty Tuesday! Your recipe has been pinned to the Tasty Tuesday Pinterest board! Please join us again this week! I love the epic succulents that come with this awesome soup with the maple syrup and awesome spices.It sounds so lovely for fall.Thank you for the recipe. sounds so good! Love the Maple in the recipe! Thank you for sharing! This sounds delicious! I have never put maple in carrot soup! This looks amazing. Soup is a staple in my house. I will have to try this soon! Mmmmmmm. I have never made a carrot soup – love eating it, just never made it. I may have to give this a go! This is the season when we start looking for different soup recipes. Standby’s are great but sometimes you just want to try something different. I cant wait to make this it looks good for a a cold fall day. Sounds good, I never would of thought to add maple syrup to carrot soup but I am sure it would be a great addition! Thanks for the recipe, I will have to try it out! This soup sounds super tasty! Thanks for the recipe! When I first saw this I thought, oh great…another cold carrot soup, but I was thrilled to see that this is served warm! The cold days and nights are coming fast and this would be a great soup to warm the insides. The maple syrup sounds like a yummy addition! I would never have thought of adding Maple Syrup. This sounds really interesting, delicious, easy, and perfect for the Fall! this sounds amazing. love the savoury sweet elements.